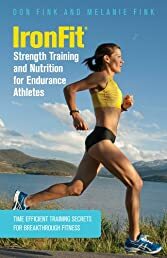 Fully illustrated with depictions of proper exercise technique, this book contains exciting strength training programs based on sport (e.g., triathlon, running, cycling, swimming) and levels from beginner to advanced. For the marathon runner, triathlete, duathlete, distance swimmer, or cyclist, these programs will complement any other training regimen an athlete follows. Written without confusing jargon, IronFit® Stregth Training… provides concise and easy-to-follow information. Don and Melanie Fink of IronFit® have coached hundreds of athletes over several decades at all levels, from weekend warriors to world champions. Their innovative approaches to strength training and nutrition not only complement an athlete’s sport-specific training, but they do so in the most time-efficient and enjoyable way possible. Multi-sport and multi-leveled, this book provides 27 specific program schedules – 9 sports and 3 levels each to give readers: 1) A progressive strength and core training program for their specific sport and level. 2) A mind and body preparation program to maximize benefits. 3) A traveling strength and core program for travel with little or no equipment. 4) A fueling and hydration routine to maximize performance before, during, and after competition. 5) A healthy eating and lifestyle plan.